with Prince Charming, the outrageous "chauffeur"
Begin your night with fun-filled laughs! & set the tone for the last night out before marriage! & comedian extraordinaire, Don Murchison! This is our most popular act for Hens Nights! 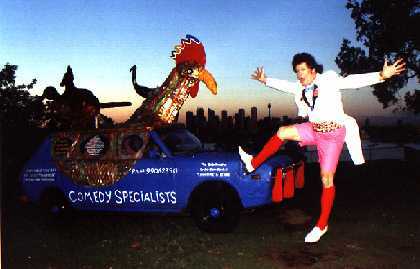 Pretend as if the "Hen" is being picked up by a Stretch Limo . . . . Then up fronts "Prince Charming" [alias comedian, Don Murchison] who is dressed colourfully [in pink, red or paisley, with formal white tails] to announce that he is her "date" for the night! He leads her to the car, where she receives her second surprise to find it is NOT a stretch-limo, but in fact a very "stretched chook!" ~ The unique near vintage CHOOKMOBILE, complete with crass PINK interior decor!... After pouring a glass of bubbly for his guest of honour, & crowing (through a speaker on the bonnet of the Chookmobile), Prince Charming drives off into the sunset, for a slapstick journey of adventure... which includes a staged breakdown... arriving at the destination, which is usually a restaurant, where she re-unites with the other girls! The hilarious, "incident" & prank filled journey of adventure includes faking a breakdown, where he stalls the car, opens her door & leads her to the bonnet, handing her a very large spanner. Most girls initially follow in other vehicles or a bus. The faked breakdown is their signal to become the audience as Prince Charming, guitar in hand, sings For She's A Jolly Good Lady, dusts her down with a chook feather duster, combs her hair with an oversized comb and washes her hands with water squirting out of the wee hole at the back of the Chookmobile. She may be helped to mount the Chookmobile bonnet for spectacular photo opportunities! To end the faked breakdown, providing a suitable location is chosen, Prince Charming often dances with her on the footpath, teaching her some Ceroc dance steps. After the faked breakdown the girls race ahead to arrive at the restaurant or destination, so they can be the welcoming party, leaving the Hen appearing to be on her own with Prince Charming! When they arrive, the Hen is given a rousing reception by the other girls. Prince Charming delivers a specially prepared comedy script about the Hen & her pending marriage, upon arrival at the destination. This is in the form of a short witty speech. It can be outdoors upon arrival, or in a restaurant if a private room is booked or it is not too noisy. Prince Charming can propose a toast prior to the speech if it is delivered in a restaurant. The speech ends the act. The Hen is given a copy of the script with best wishes for a wonderful marriage! This fabulous, fun-filled Act sets the tone for a great night out, with lots of laughs, photo opportunities and merriment. COST: $485 + travelling time. Let us know where you would like her picked up & taken to, then we can let you know the exact travelling expenses. * A fabulous option is to book a special HENS NIGHT COMEDY HARBOUR CRUISE. This is a complete package, especially for Hens Nights, which includes a 4 hour cruise on Sydney Harbour, the Chookmobile-'Limo' Act, Musician / DJ, optional Carricaturist, plus a fine selection of Thai food delivered to the boat! You have the entire boat to yourselves!!! This option is subject to the availability of the boat we use & the price can change depending on charter costs & the cost of the food. It is necessary to confirm any cruise prices with us. * A COMEDYGRAM is an another option. A costumed character can come directly to a restaurant, to deliver a specially prepared script, which is based on information you supply to us after completing a questionaire. Characters that are popular for Hen's Nights include the Fake Psychic, Mad Psychiatrist, Chook / Rooster, Condom, "Baby" in Nappies, "Ex-boyfriend" & Cupid. Click here for possible Additional Charges, Travelling Expenses, Terms & Conditions. Please CLICK HERE to see our PHOTO GALLERY OF HENS NIGHTS. Facsimile: We have now discarded our fax in favour of email. This page was last amended 22.3.2013.